Since going corn-free, the thing I've missed the most is popcorn. I grew up in a family where popcorn was practically its own food group. And my little one is the same way, he loves his popcorn. So, whenever I made him popcorn, it took everything I had to not consume a handful of it myself, even knowing the stomach ache I would get if I did consume it. So, when I discovered that other grains pop, I began testing them out to see which I like the best. Popped Sorghum (the one on top in the picture above) is by far the winner. See how it even resembles popcorn? It has a slightly sweet taste, just like sorghum and is amazing lightly salted, just like popcorn. My older son, who has never been huge into popcorn, absolutely loved popped sorghum and whenever my little one asks for popcorn, he pipes in and asks for sorghum. 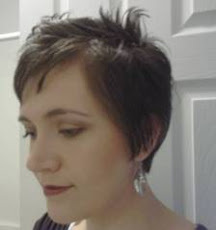 The runner-up is amaranth (the bottom one in the picture above). It's absolutely tiny as a grain, so even popped it's still absolutely tiny. 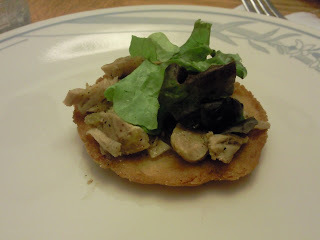 So, isn't finger food like the sorghum is, but it's still delicious and really light in texture. We call it 'ant popcorn' in our house, if you have little girls it could be 'fairy popcorn' instead. 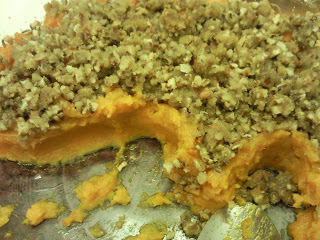 :) We either lightly salt it and eat it with a spoon. Or I have found that it makes for a fantastic cereal with my non-dairy milk and cinnamon sprinkled over it. So, you can actually see how much smaller sorghum and amaranth are compared to popcorn, I popped some for you...yeah, popcorn is monstrous. But, another plus to both of these grains is that they are hull-less...meaning, no hulls stuck in your teeth after eating them. That was always my biggest complaint about popcorn. 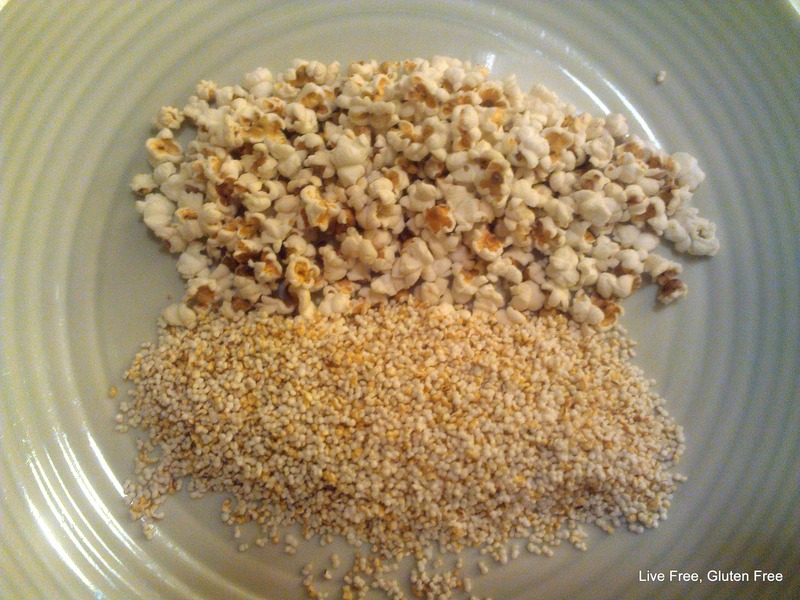 I pop both of these on the stove top and it's incredibly fast and easy to do! This post was shared on Slightly Indulgent Tuesday, Allergy Free Wednesday, Gluten Free Wednesday and Whole Food Friday. 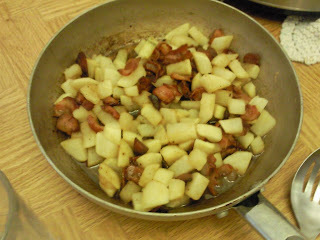 Heat a saucepan (I use a 1 1/2qt one for 1/8 cup and a larger one for 1/4 cup) over medium-high heat until piping hot. Add in oil and let it heat for a minute. Add in the grains. Once it starts popping, cover and shake the pot back and forth across the burner to keep the grains moving. When the popping slows remove it from the heat and pour into a bowl, lightly salt and enjoy! Note: Only pop small amounts (i.e. 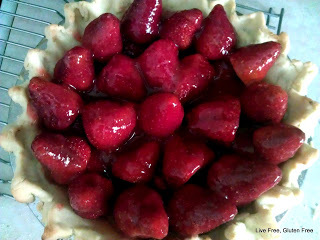 no more than a 1/4 cup) at a time, it pops better when there is less in the pan, so you'll just be wasting your grain if you add in more than a 1/4 cup at a time. Just do multiple batches, it really only takes a minute. 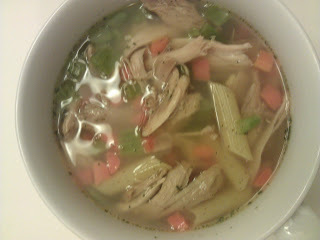 Heat a saucepan (I use a 1 1/2qt one for 1/8 cup and a larger one for 1/4 cup) over medium-high heat until piping hot. Add in the grains. Once it starts popping, cover and shake the pot back and forth across the burner to keep the grains moving. 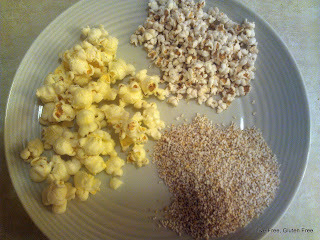 When the popping slows remove it from the heat and pour into a bowl, lightly salt and enjoy tiny 'popcorn' with a spoon, or add milk and cinnamon and eat it as cereal. Note: Do not add oil to the pan if you are popping amaranth...it won't work. It pops the best in a hot, dry pan. I was in an experimenting mood on Sunday, and I've heard that millet flour makes a good substitute for corn flour, so I thought maybe it would make a good sub for corn meal...and in turn, I would be able to eat cornbread again. Well, it does. 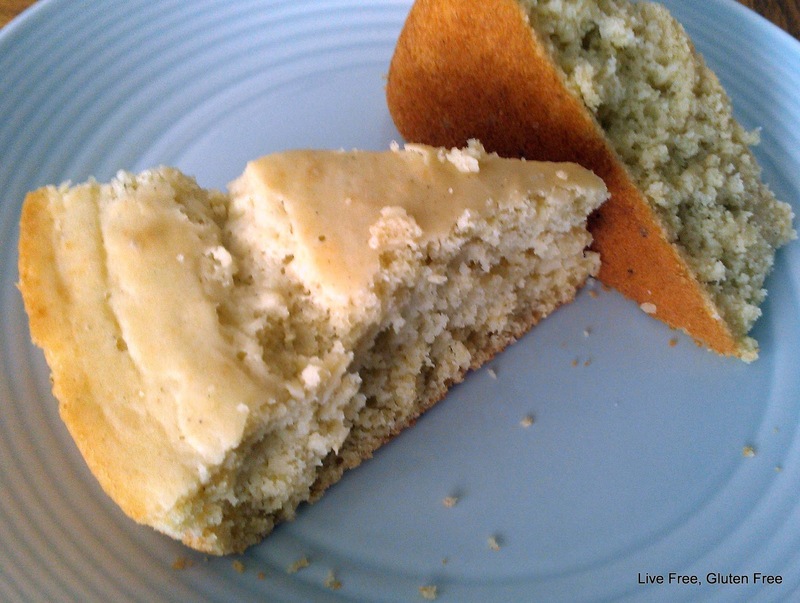 This 'cornbread' obviously doesn't quite taste exactly like cornbread, but it's pretty dang close, which is amazing considering I swapped out the main ingredient. 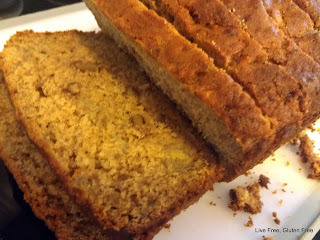 So, for those of you that are corn-free enjoy some 'cornbread'! This post was shared on Slightly Indulgent Tuesdays, Gluten Free Wednesdays, Allergy Free Wednesdays, Whole Foods Fridays, Gluten Free Fridays, and Allergy Friendly Fridays. Preheat oven to 350F. Grease a 10" cast iron skillet and set aside. Combine the wet ingredients in a stand mixer. In a separate bowl combine the dry ingredients. 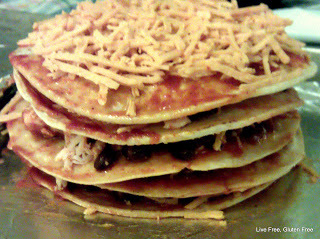 Slowly add the dry ingredients into the wet ingredients and mix well. The batter should be like thick cake batter. Bake about 25 minutes or until a toothpick comes out clean. 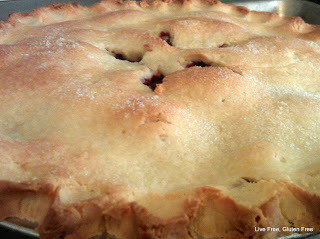 Best served warm and fresh out of the oven. 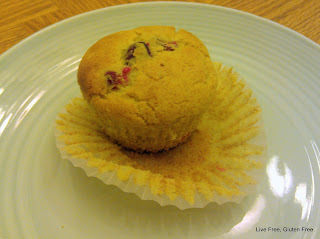 We got some cranberries in our Bountiful Basket this week, so I decided to use them in muffins. This recipe is easy to throw together and like all muffins, it tastes best when they are fresh out of the oven. 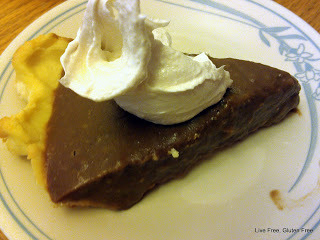 This would be the perfect way to start out your Thanksgiving day...so go try it! Preheat oven to 400F. 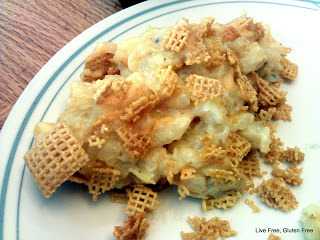 Grease or line muffin tins and set aside. Mix together the dry ingredients in a medium sized mixing bowl. In a separate bowl mix together the rest of the ingredients (except the cranberries). 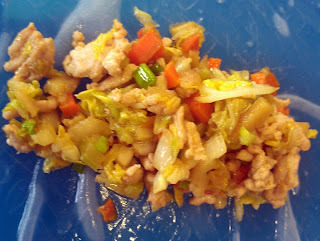 Add the wet ingredients into the dry ingredients and mix well. 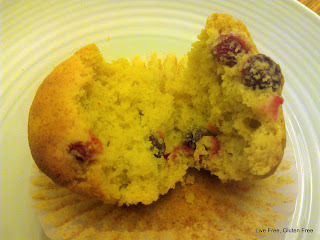 Fold in the cranberries and spoon into the muffin tins (you should add about a 1/4 cup into each tin). 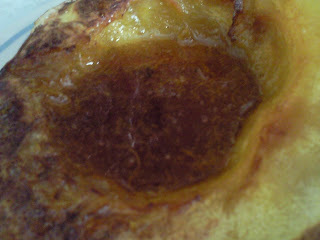 Make at 400F for 18-20 minutes or until golden brown and a toothpick comes out clean. 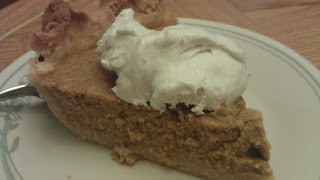 *note: if you can't find corn-free baking powder, you can use 1/2 teaspoon cream of tartar and 1/4 teaspoon baking soda for 1 teaspoon of baking powder...it isn't doubling acting, but it will work. Thanksgiving is just around the corner, so just in case you need some ideas for your big meal (and leftovers) I've made a list of recipes for you to browse. Also, if you haven't checked out my different tabs, check them out! 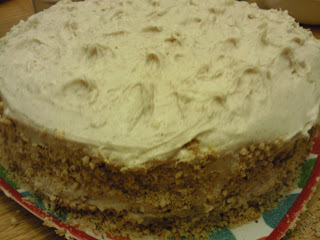 I have some excellent nutritional information on gluten free flours on my GF Flour 101 page and a fun cake ideas page. I already have banana bread/muffin recipes, I know. 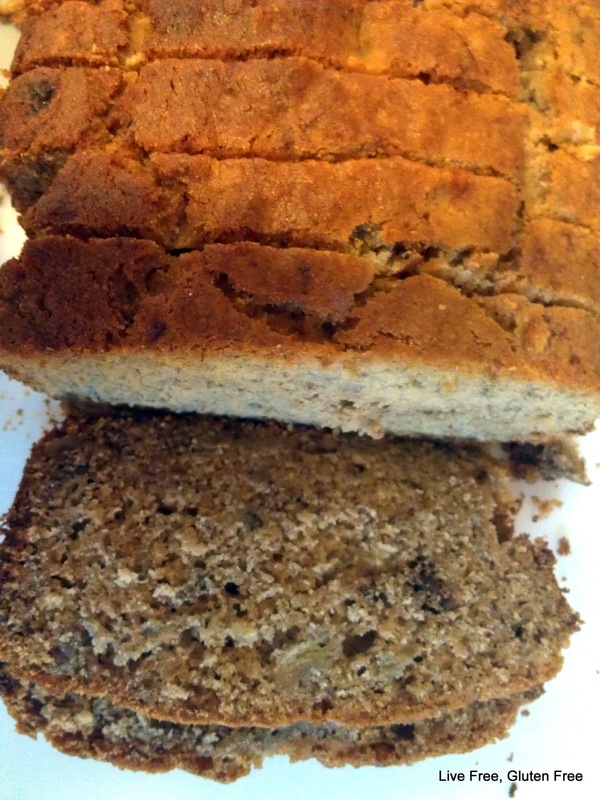 If you don't believe me here's links to #1, #2, and #3.﻿ So, yeah, I have a thing for banana bread. And it was time to make it over again. You see, my other recipes are good, my boys especially love #2, but it doesn't take like classic banana bread...and there's a lot of white sugar which now gives me stomach aches and horrible headaches...so, yep, time to make it over. 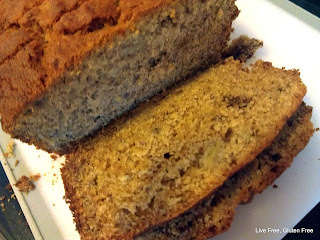 This banana bread is as classic as banana bread can get, it's moist with that hint of cinnamon and nutmeg. And the best part? 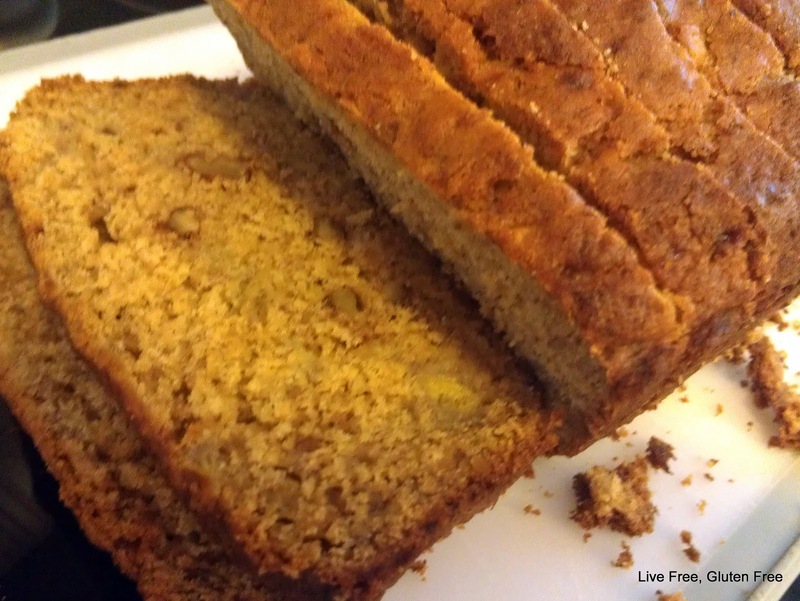 It's made with coconut sugar, agave (or honey) and coconut oil...so much better for you. This post was shared on Slightly Indulgent Tuesdays, Gluten Free Wednesdays, Allergy Free Wednesday, Gluten Free Fridays, and Whole Food Fridays. Prehead oven to 350F. Grease a large loaf pan (9X5 inch) and set aside. In a mixing bowl combine all the dry ingredients. In a separate bowl combine the eggs, banana, coconut sugar, agave, and coconut oil. Pour the wet ingredients into the dry ingredients and mix until well combined. Fold in nuts and pour batter into the loaf pan. Bake at 350F for 50-60 minutes or until a wooden toothpick comes out clean. The the bread cool for 5-10 minutes in the pan before removing in and completely cooling it before slicing...don't try to slice it warm, it will just fall apart. I also have lemons, cucumbers, strawberries, and grapes to supplement the basket. 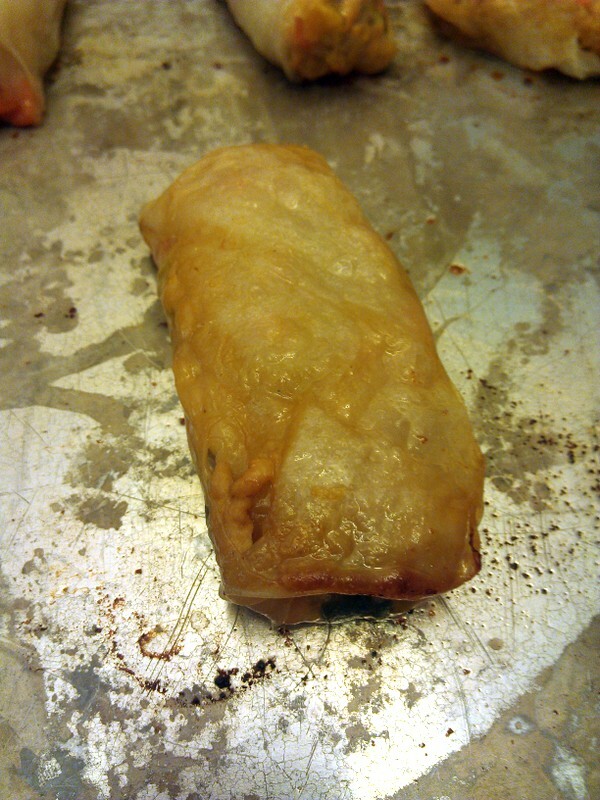 Here's the yummy filling before I rolled it up in my spring roll paper (i.e. rice paper). All rolled up...you can eat it like this, or stick in on a very well greased pan and bake it to crisp it up a little. 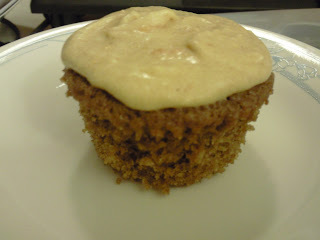 Mine after the baking process...they were amazing! 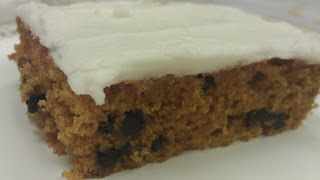 This post was shared on Slightly Indulgent Tuesdays, Gluten Free Wednesdays, Allergy Free Wednesdays, Whole Food Fridays, Gluten Free Fridays, and Allergy Friendly Fridays. Salt the cabbage with 1 teaspoon of salt and set aside for at least 5 minutes. Squeeze out the excess moisture. Heat oil over medium high. Stir fry vegetables for about 5 minutes, then add in turkey and cook until no longer pink. 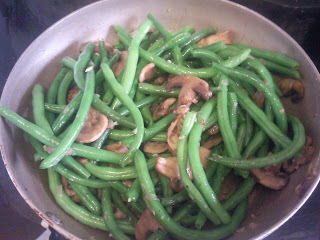 Stir in soy sauce and heat through. 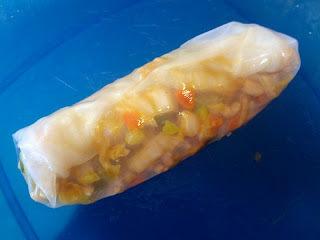 Place ~2-3 tablespoons of filling into each sheet of rice paper and roll up. 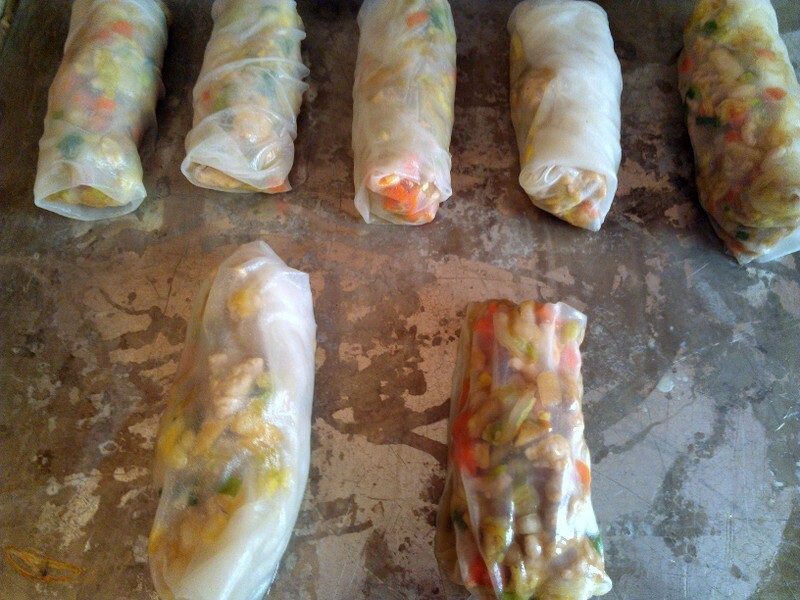 You can eat it like this or fry or bake the wraps. If baking heat oven to 400 degrees. Spray your baking sheet with oil and brush the wraps with oil as well (they will stick if you don't liberally cover them with oil). 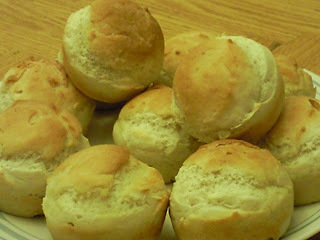 Bake for 20-25 minutes, turning them (carefully) halfway through. Today is my little one's birthday. 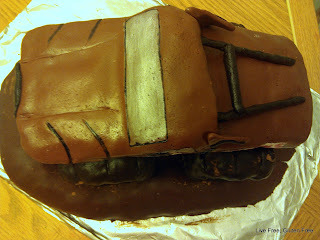 Now, if you've been following my blog for long, you'll know that I go all out for birthday cakes. 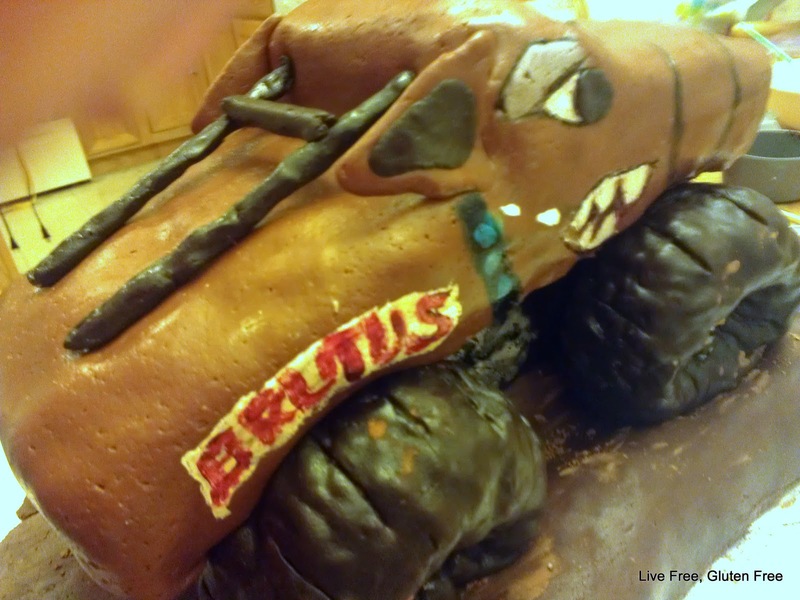 My boys can ask for anything and I'll do my best to recreate it in cake form. To see my past creations, you can go to my Cake Ideas page. 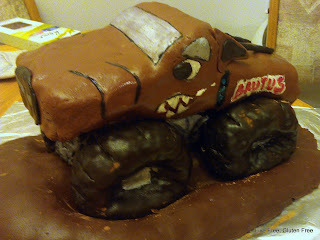 And please note that I've never had a cake decorating class, so I'm not an expert cake decorator, just a mom trying to make my kids' birthday specatular. 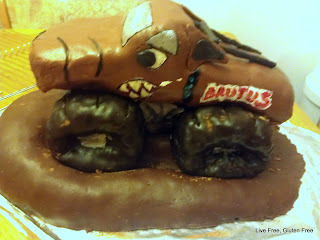 My little one asked for a Brutus Monster Truck cake this year, and he's been asking for it since his brother's birthday in January...so, for almost a year he has patiently waited for his turn to have a monster truck cake. (I made my older son a Gravedigger cake for his birthday in January). Happy 5th Birthday to my baby! 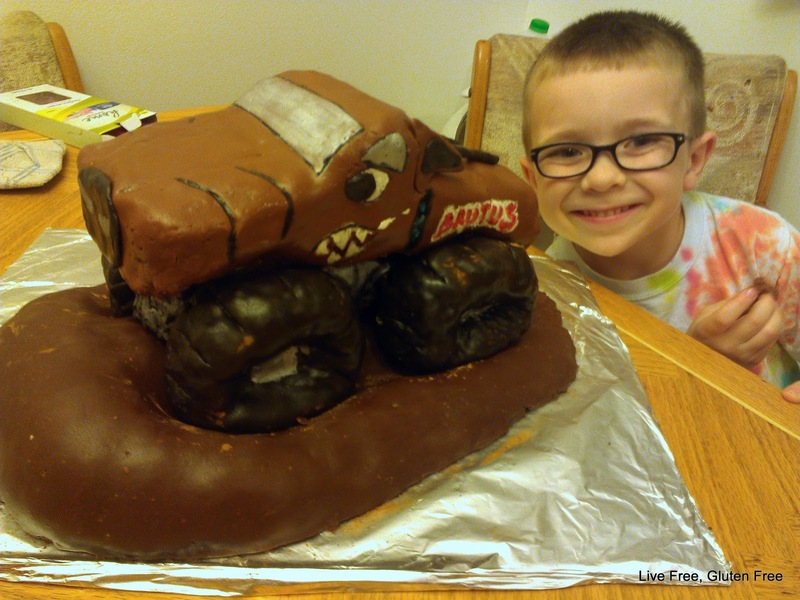 Wednesday: Happy 5th Birthday to my son! Birthday cake...I'm getting anxiety about it, hopefully it'll turn out well. 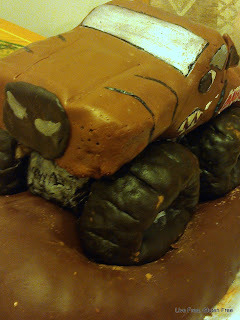 It's another monster truck cake (remember my Gravedigger one for my older son? )...my little one wants Brutus, so wish me luck!